I tried wheat berries for the first time back in February at my friend Bethany's bridal shower. There was a selection of different salads and sandwiches for the girls to choose from and intrigued by the nutty looking dish, I served myself a tiny scoop to taste. A few minutes later I found myself exclaiming, "What is this stuff?! This is so good!" 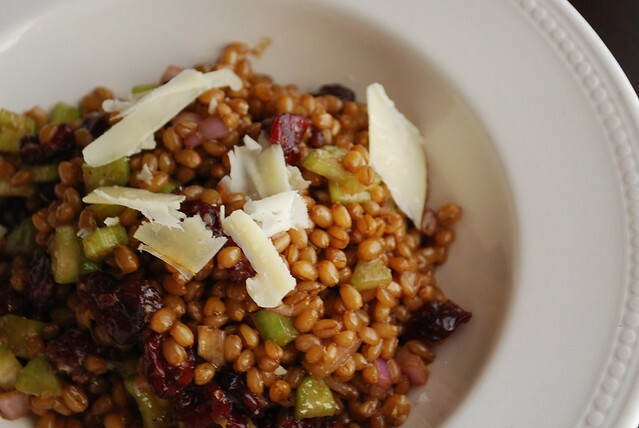 The chewy, nutty little grains were wonderful and especially perfect paired with the sweetness of the dried fruit in the salad. The following weekend, I headed to Whole Foods in search of wheat berries. I looked all over: in the grains, the bulk aisle, the pasta aisle, even the frozen section, but they were nowhere to be found. I repeated my search in vain a few times that year, always surprised that a place like Whole Foods would carry 5 different kinds of quinoa, but not a single wheat berry. I soon forgot about them and gave up my search. It wasn't until a couple months ago, after seeing them served in my office cafeteria, that I became determined to find them again. I went to Whole Foods and searched package by package. I found nothing labled "Wheat Berries," but I did come across a bag of "Whole Grain Wheat" that looked incredibly familiar, though the word "berry" wasn't mentioned anywhere on the label. I turned it around and in the preparation instructions found that the grains were called "berries." "Aha!" I thought as I dropped the bag into my basket. 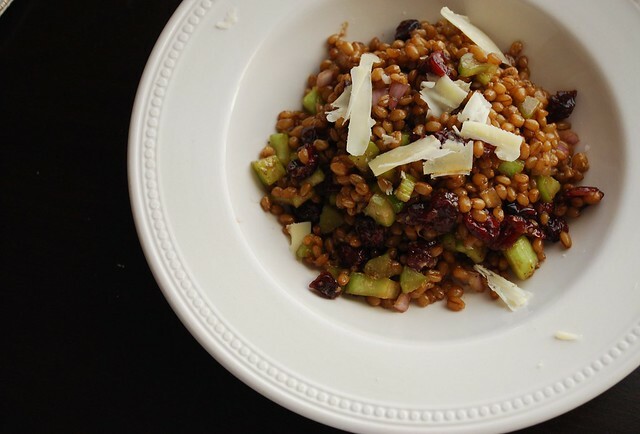 Wheat berries require a tiny bit of preparation before you can use them. The berries, which are essentially intact grain of wheat (the stuff you grind to make flour), are an incredible source of whole grain. They do, however, need to be cooked first. You can do this one of two ways: Either rinse and then combine with 3 cups of water for every cup of berries and let soak overnight or for at least 8 hours. Then drain, add a fresh 3 cups of water per cup of berries, and let simmer on low until most of the water is absorbed (about 20-30 minutes) OR you can just rinse and combine with 3 cups of salted water for every cup of berries and simmer for about an hour. It really depends on how much time you have. You can eat wheat berries hot or cold; I prefer them cold in salads, but they can also be used with creamy sauces for a “risotto” type dish. You can also add to soups. This salad, made with a sweet and sour dressing and a combination of crunchy vegetables, is one of my favorites. The cheese on top at the end is what makes it so be generous! Heat the 6 cups of water over high heat until boiling. Generously salt the water (like you would for making pasta) and add the wheat berries. Stir until they’re completely submerged and then lower the heat to medium low. Cook uncovered for about 45 minutes, or until the wheat berries are soft and have the texture of cooked brown rice or farro. Drain off any remaining water (much will be absorbed) and spread the wheat berries out on a large baking sheet to cool. Set aside. In a large bowl, combine the olive oil, vinegar, lemon juice and zest. Whisk well. Add the cooled wheat berries on top and toss to coat completely. Stir in the diced celery, diced shallots, and cranberries. Season with salt and pepper to taste. Top with shaved cheese (or serve in individual bowls and garnish with cheese).